A technician performing a laboratory test. 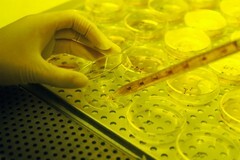 She is preparing a tissue culture of a hamster embryo. This is being done at the Frederick Cancer Research and Development Facility (FCRDF). The yellow glow that is visible in the background is the ultraviolet light that is used to keep the room sterile.